NOW: The worn clapboards of the by then nameless old apartment at 1413 Queen Anne Ave. were redressed with stucco in the early 1980s. This shapely subject was uncovered long ago in a collection of unidentified negatives. Only recently I discovered that finding its place was easy for the name of this apartment house is signed on the glass front door. 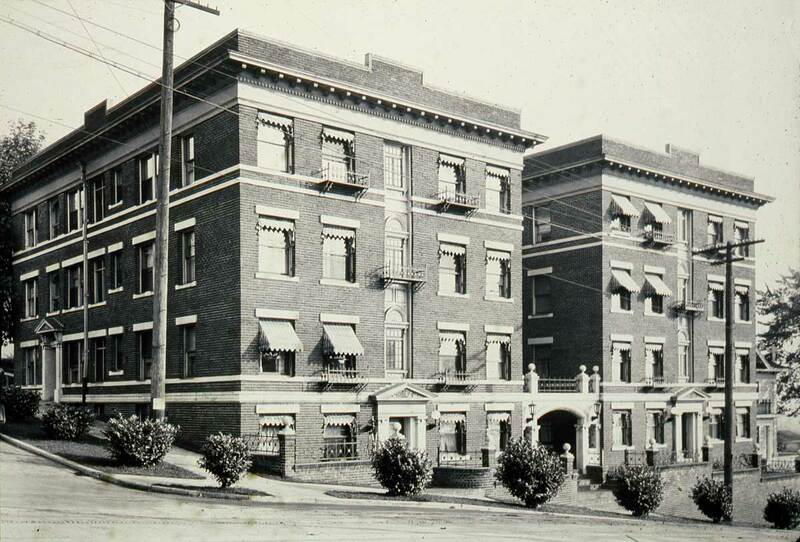 This is – or was in this early 20th century record of it – the Wilhelmina Apartments at 1413 Queen Anne Avenue. It was then the tallest structure this high on the avenue with views to the city and the bay. 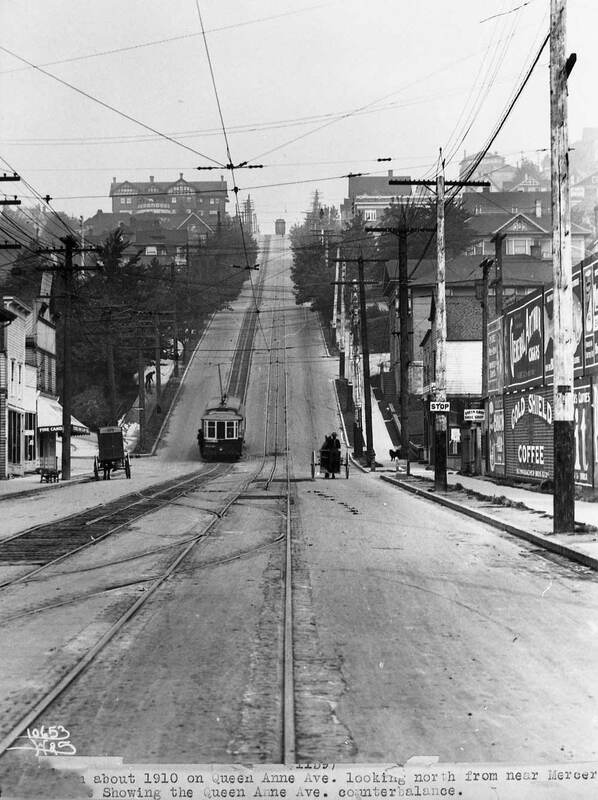 And it was conveniently set at the top of the “Queen Anne Counterbalance,” that exceptional tunnel machinery that helped pull trollies up the steep avenue and also safely govern their descent. 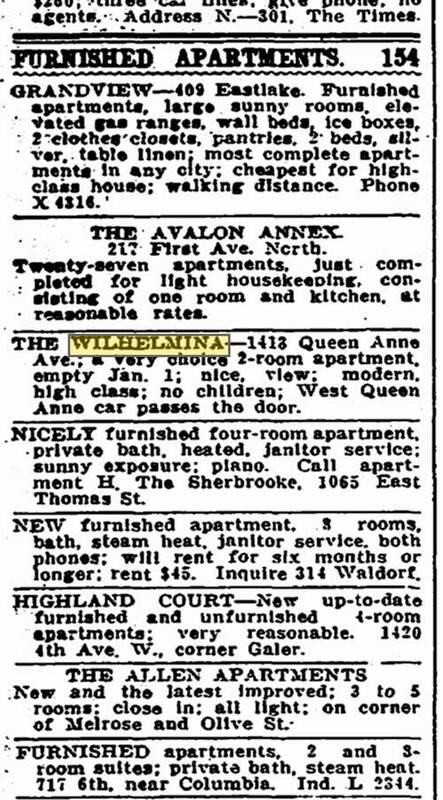 The Winona first indicates “no objection to children” in the 1920s. 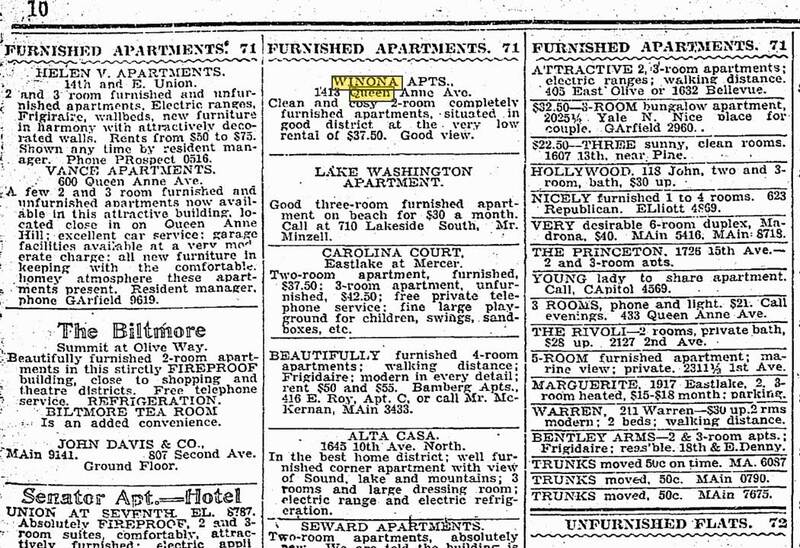 A Times classified for 1928 reads “Clean and cozy 2-room completely furnished apartments, situated in good district at the very low rental of $37.50.” Following the market crash of 1929, the monthly rate was soon lowered to $25. By 1955 it had doubled to a mere $52, but by then it had no musical name, only an address. 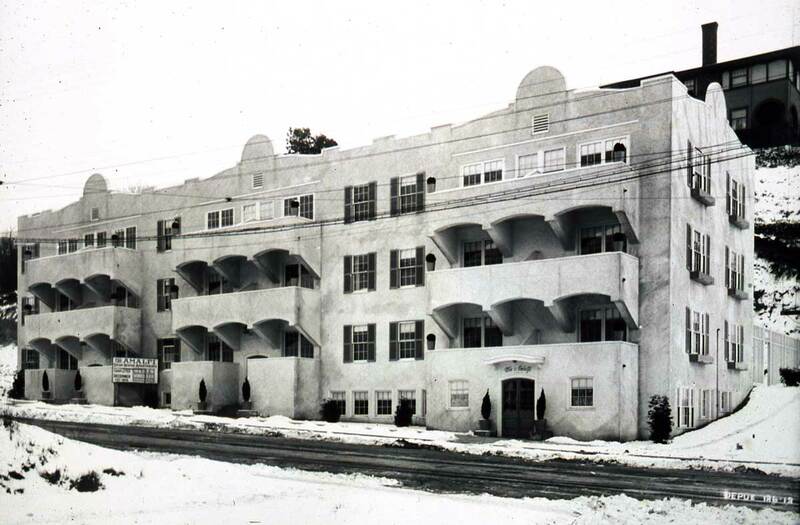 While Diana James doubts one published claim for the Wilhelmina/Winona, that it was the first apartment on the hill, she admits that she has as yet found no older flat that has kept its footprint on the hill. She adds, “I like it because it is what it is – its elegant symmetry with bay windows for light and centered balconies for fresh air visits. I could tell you that it is 12 units, with four to a floor, and probably two more in the daylight basement.” What James could not surmise from the street, the present owner – since the mid 1970s – reveals. There’s a detached 15th unit in the rear. Most likely, it was once a garage. 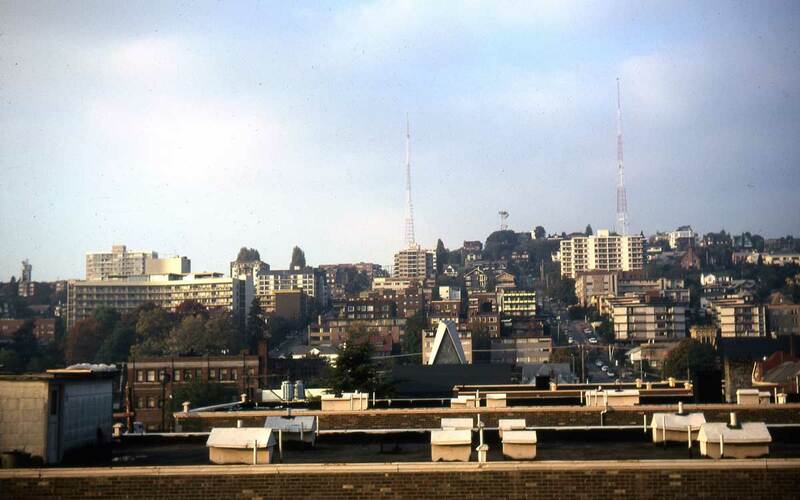 With some searching - through the members of the TV tower - the Wilhelmina/Wiwona can be detected in this view taken by Lawton Gowey on his visit to the top of the old Queen Anne Standpipe (1901) looking west in 1978. Lee Street is on the left, leading west past St. Anne Catholic Church and reaching West Queen Anne Primary, now a condo of distinction. Patches of Galer Street can be detected through the tower's struts. 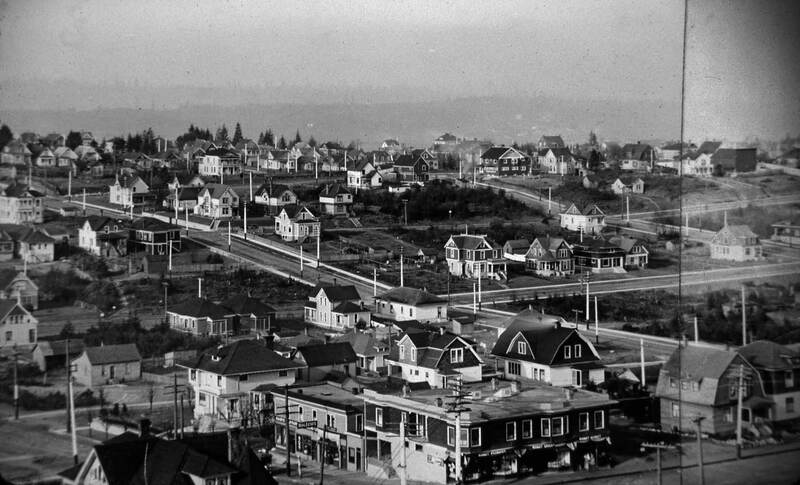 Yes Jean if the reader clicks through they will first meet the 1887 Morford panorama of North Seattle taken from the back porch of the Bell Hotel at the southeast corner of Battery and First Avenue (Front St. then). We will point out the easily detected location of the then far-future Wilhelmina. After that we will keep to images that are on or very near to the Queen Anne Counterbalance. 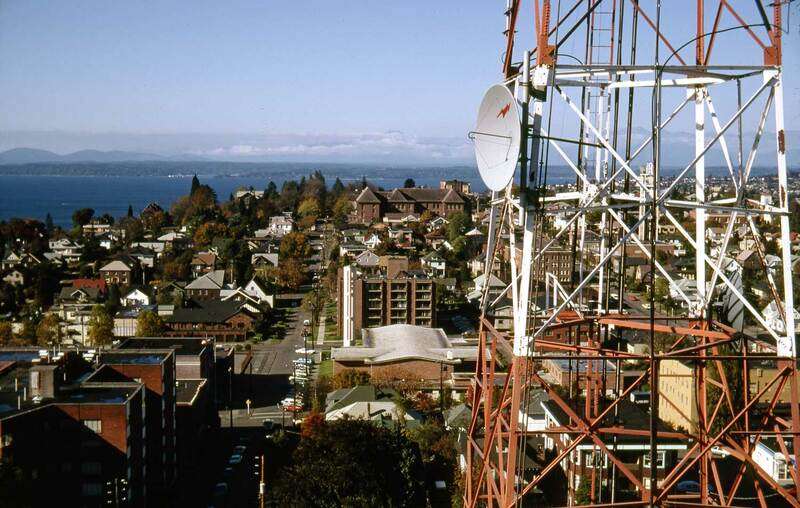 The home still of the then future Wilhelmina is set here on the Queen Anne Hill horizon where the still forested eastern summit at the center falls off to the west as it still does west of the water tower and the several TV towers. Magnolia is far left. Battery street on the right, leads to the old Denny School (opened in 1884) at the northeast corner of 5th Avenue and Battery. First Ave. (Front St.) is on the far left. Shot by Morford in 1887 (or early 1888). Here in ca. 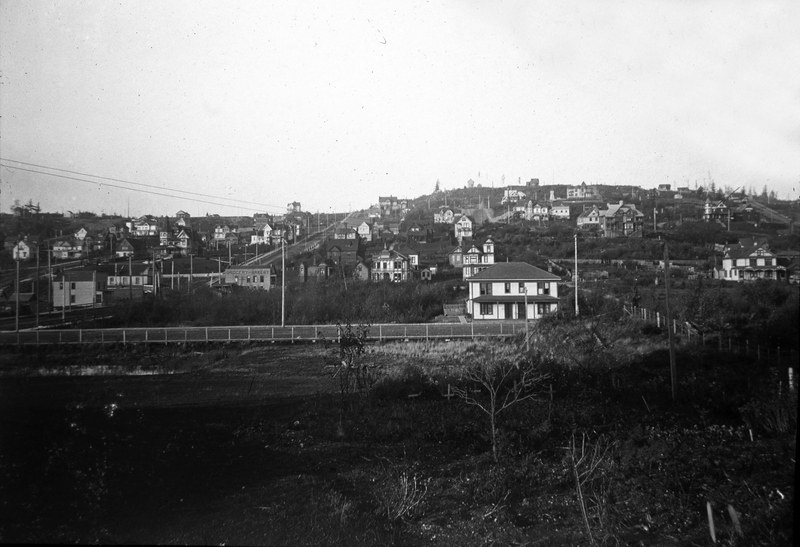 1893 the same dip in the horizon at Queen Anne Ave. and Galer Street appears at the center horizon. 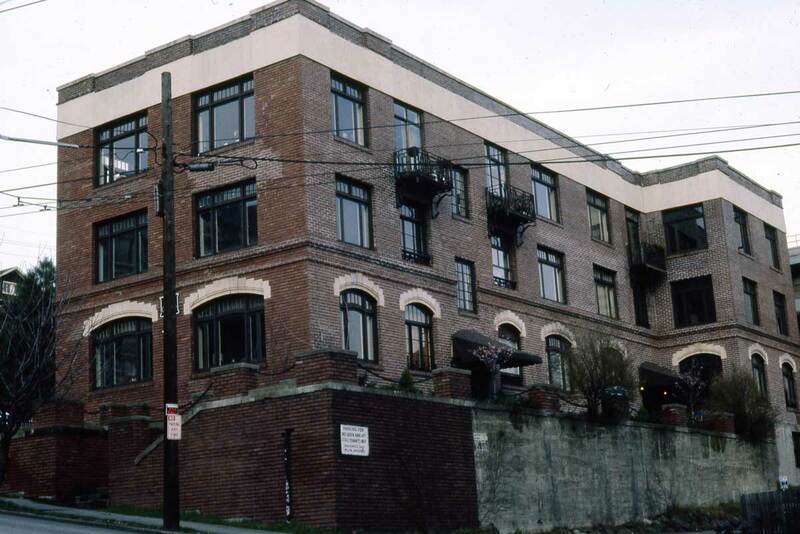 The duplex right-of-center is at the northwest corner of Mercer and First Ave. North. 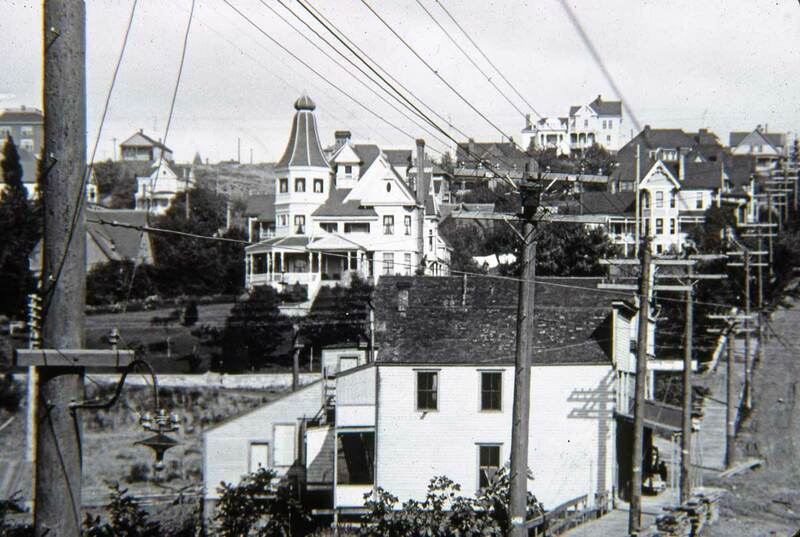 The Kinnear Mansion can be found just below the horizon on the left. We will put in a few Kinnears near the bottom, so you can consult them for its shape. This approximates the prospect and range of the 1893 photo above it. 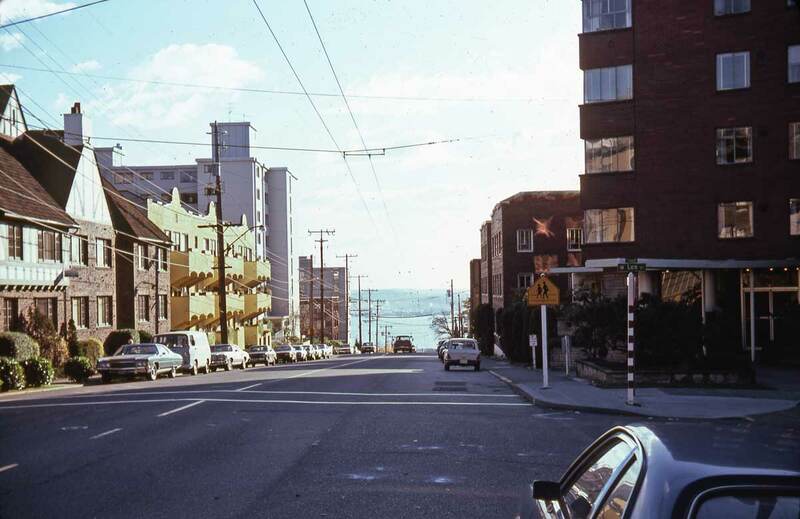 This was taken by Lawton Gowey in the fall of 1978 from the Queen Anne Post Office on First and Republican. The dip at Galer and Queen Anne Ave. is still apparent - of course. The Goth A-Frame of Trinity Episcopal is a unique neighborhood landmark. The modern sweep of the Bayview Manor is seen on the left. Looking south at the A-Frame Anglican sanctuary over the shoulder of the pantheist "glob," the Greek Restaurant that was short-lived near the corner of Roy and Queen Anne Ave. Long ago I had a delightful lunch therein with my old friend Ken Levine. It resembles the plaster of paris mountain I made - with tunnel - when still an adolescent for my model train set in the basement. 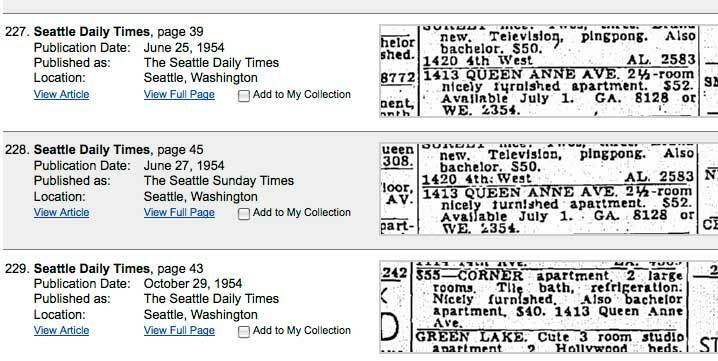 NEXT – or “Here Follows” – eight clips concerning the WILHELMINA pulled with the Seattle Public Library’s key-word search service for The Seattle Times, 1900 to 1984. They offered the potatoes for the feature. The photo itself is the meat. The Whilhelmina’s part is ordinarily highlighted in yellow. This group of clips has some “star” appeal, too – if you read to the end of them. 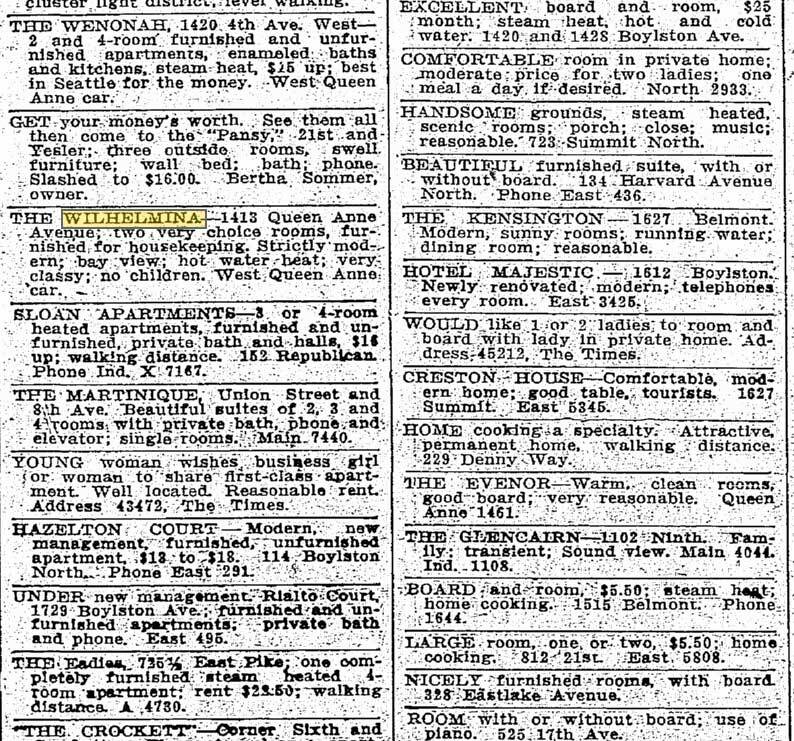 December, 29, 1908 and no children allowed. October, 23, 1911, and very classy, but still "no children." 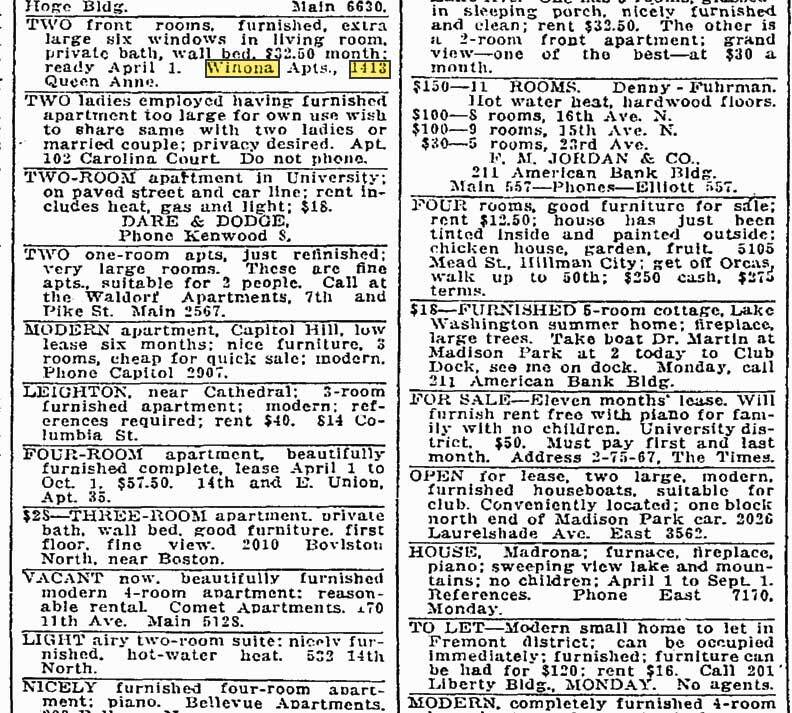 April 15, 1928, "good district at the very low rate of $37.50"
Two years into the Great Depression and the rent is set at $25. 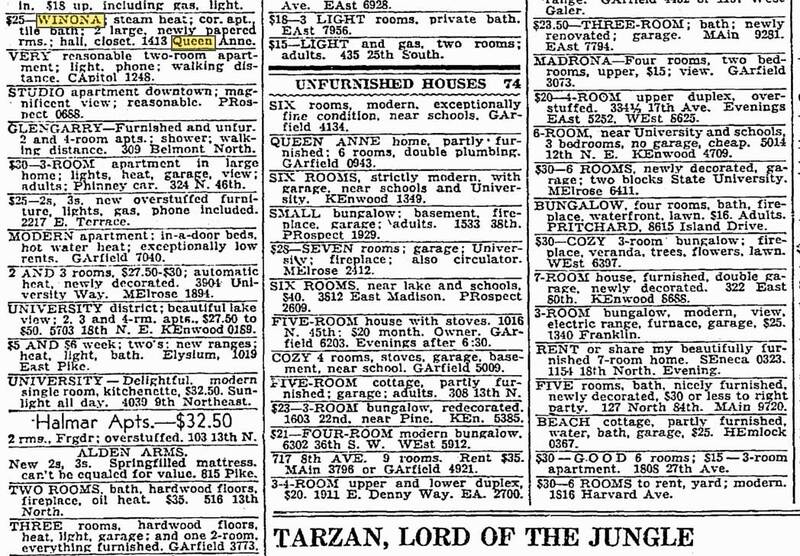 June 25, 1954 and $52 a month. February 25, 1974, an incident indicating some tough times at the Wiwona. 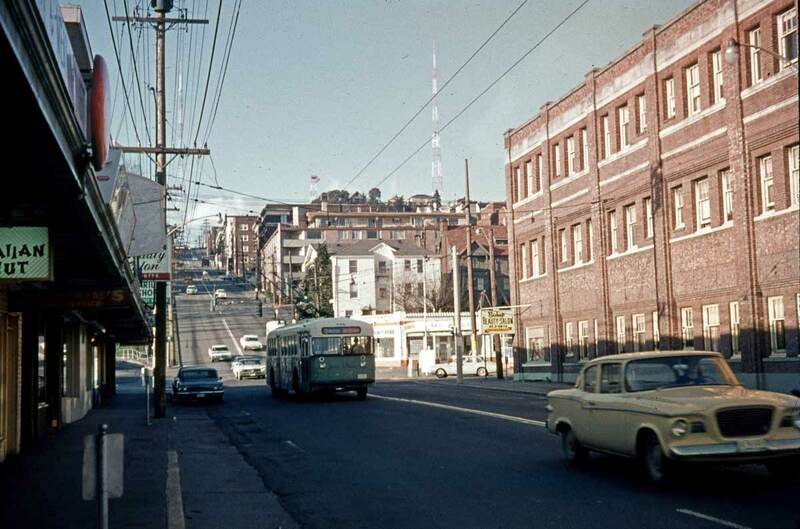 Looking north over Mercer Street and up the then new Queen Anne Ave. Counterbalance. 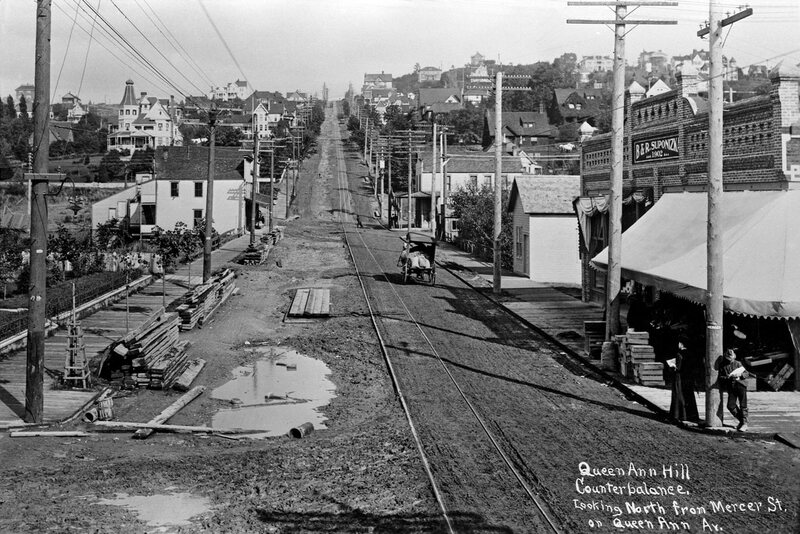 Seattle got out of the cable car business on Queen Anne Avenue (then called Temperance Street) by the late 1890s. But the one part of cable it could not abandon for many years was under the most precipitous part of the hill, that lightheaded 20 percent which became known as the counterbalance. 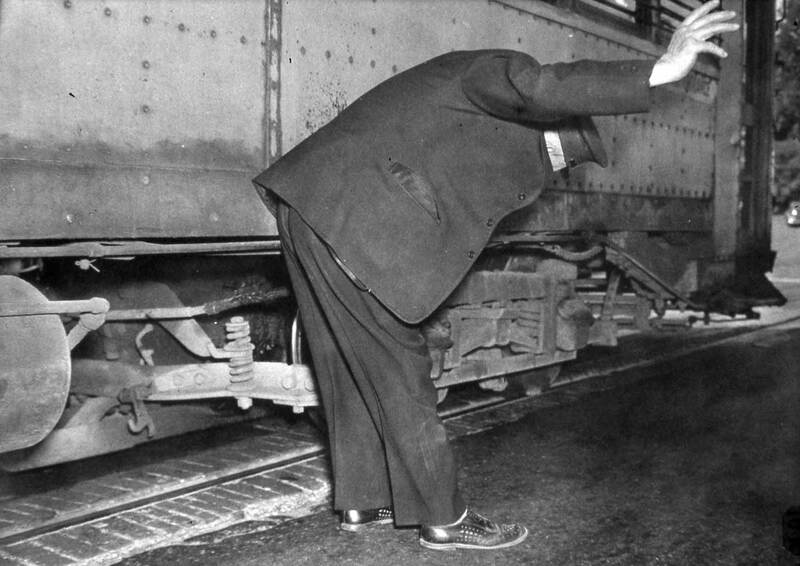 Checking the connection to the trolley, Aug. 7, 1940. 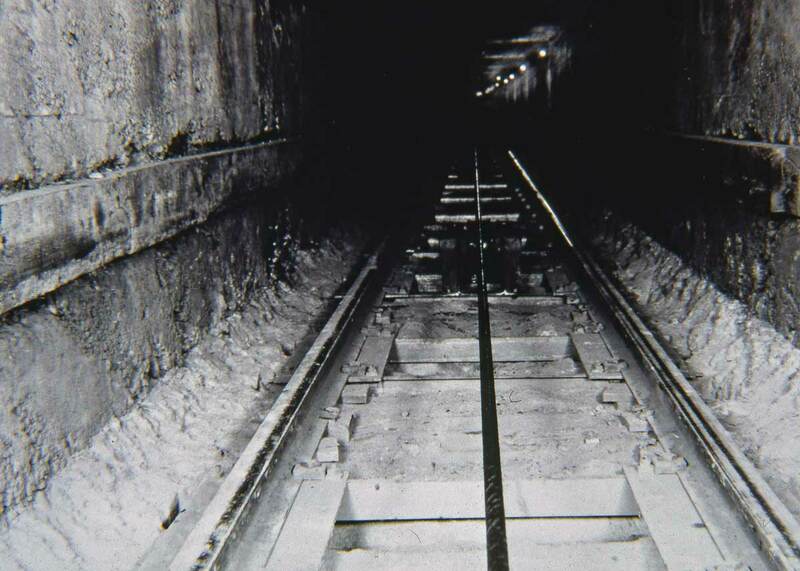 The streetcars were linked via the underground cable with a truck that ran on narrow gauge tracks through a tunnel. 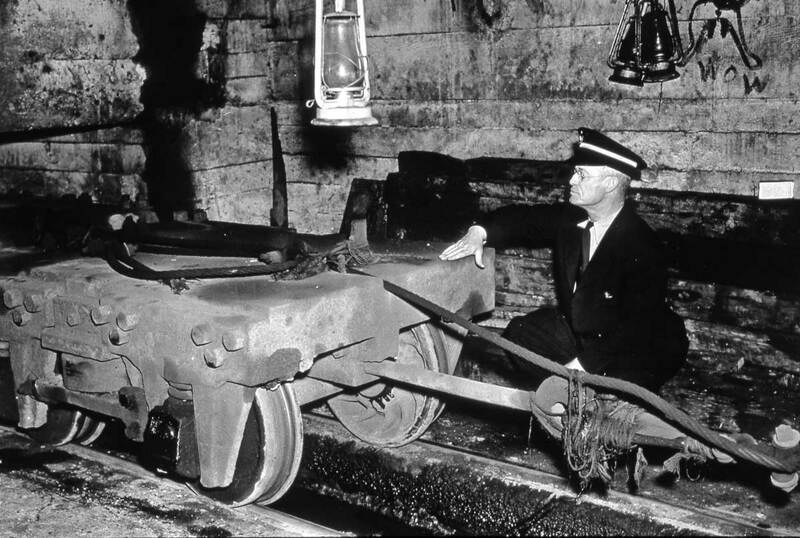 While the subterranean vehicle weighed 16 tons, the ones above ground were a heavier 18 to 24 tons. 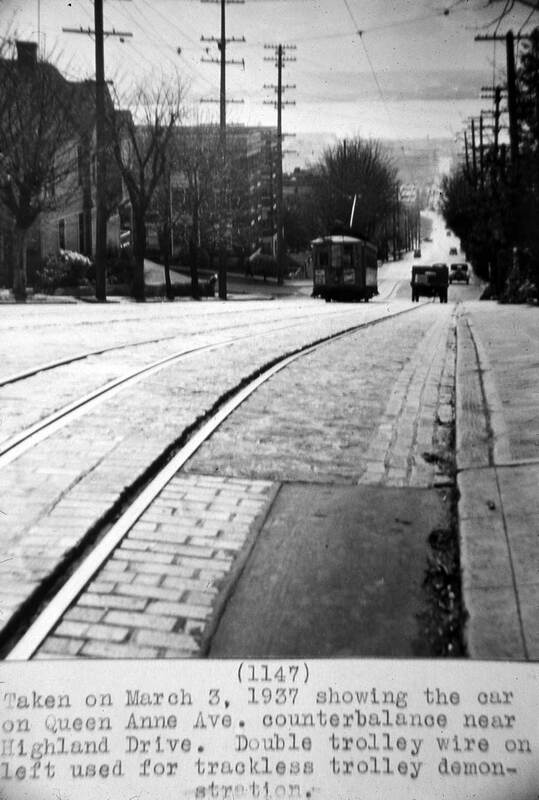 When the truck ran down hill it helped pull the streetcar uphill. 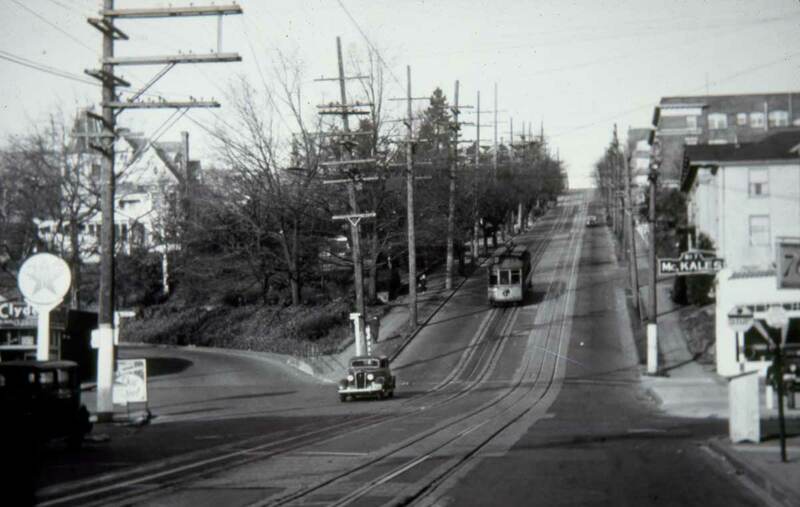 And, working the other way, the electric streetcar’s descent was restrained by the counterweight’s ascent. The counterbalance's assistance was needed between Roy Street, below, and here at Comstock, above. 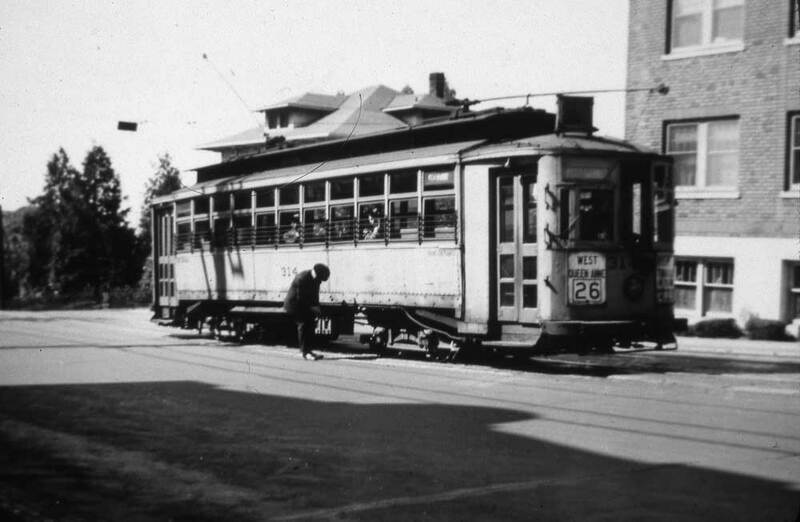 Here Municipal Transit's car #314 is being disconnected from the counterbalance in 1940. The Counterbalance north from Roy on Oct. 21, 1940. Sept. 26, 1944, sans rails. The Counterbalance in 1910 - "about it." 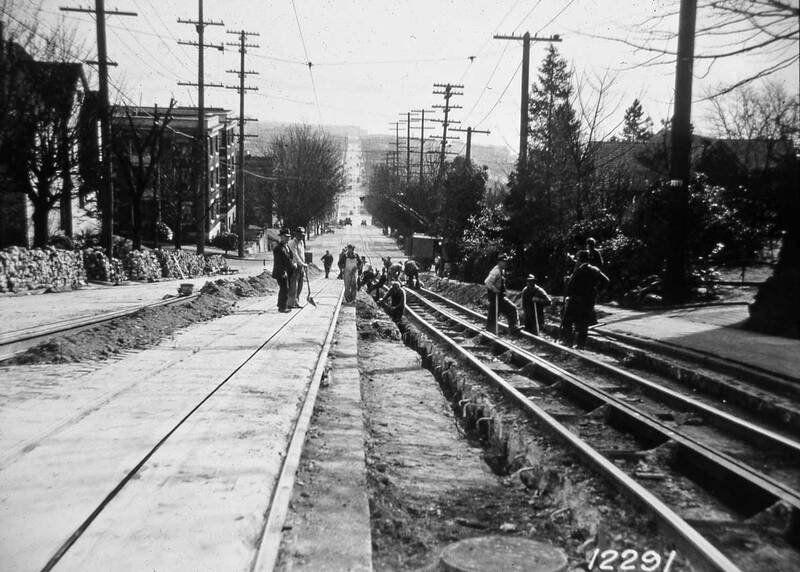 Looking south down the counterbalance from near Highland St. during a renewing of the rails on March 3, 1937. March 3, 1937 with its own caption. 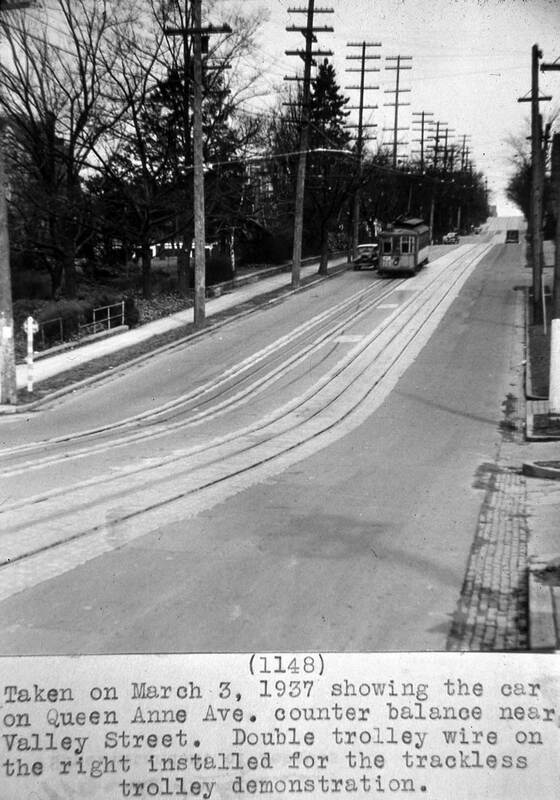 Same day - March 3, 1937 - but looking down the Counterbalance. Looking up from Roy during the removal of the track, which I speculate was soon after the counterbalance alternative - say for snow-bound days - was abandoned. The steel my have also been grabbed early for WW2 recycling. Somewhere the date is recorded, but not here yet. 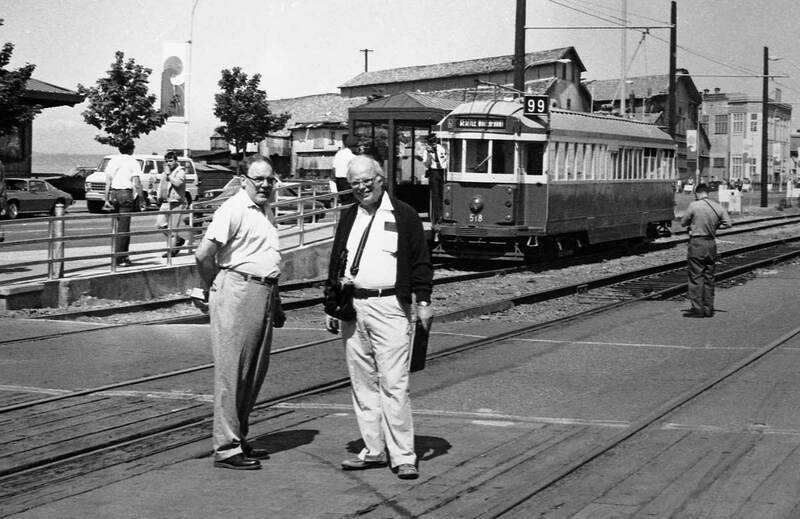 On the evening of March 5, 1937, the Seattle Municipal Railway staged a counterbalance contest between a streetcar and a trackless trolley. 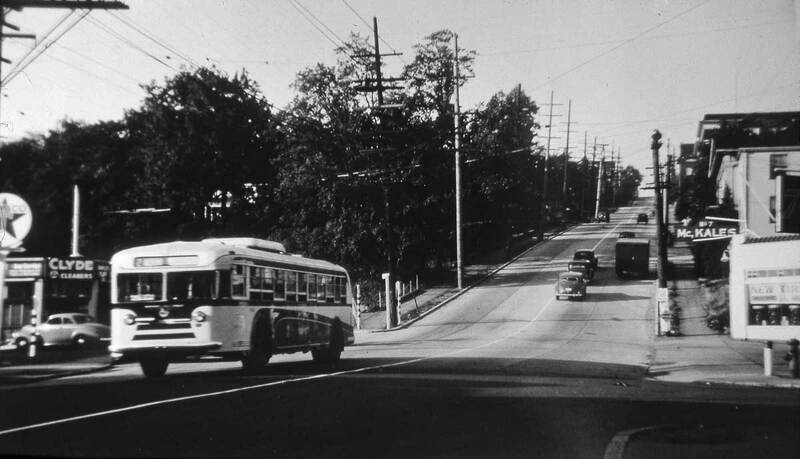 The future of the counterbalance was evident by the results: The modem coach embarrassed the streetcar by climbing the hill in less than half the time. Regular trackless coach service began on the hill Sept. 2. 1940. 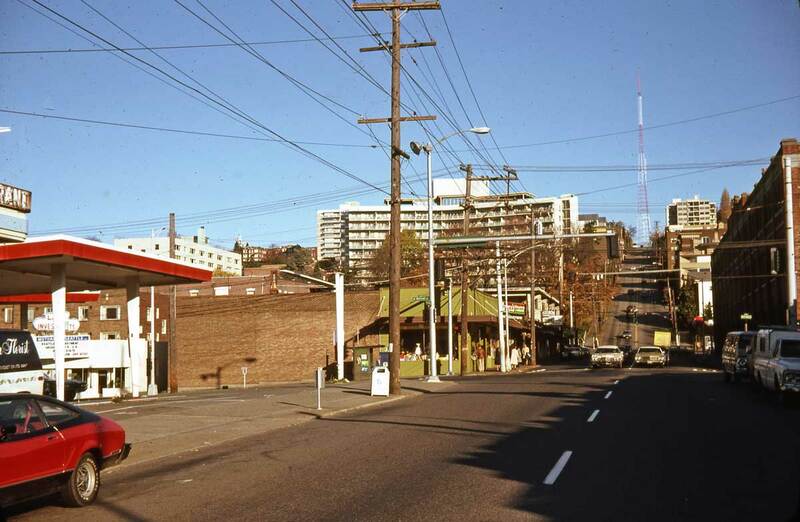 In the now scene, practically everything else in our earlier photo is gone except for what was always hidden, the two counterbalance tunnels that still run up Queen Anne Avenue. A "now" or repeat for the 1902 young counterbalance recording far above. This dates from August 1996. 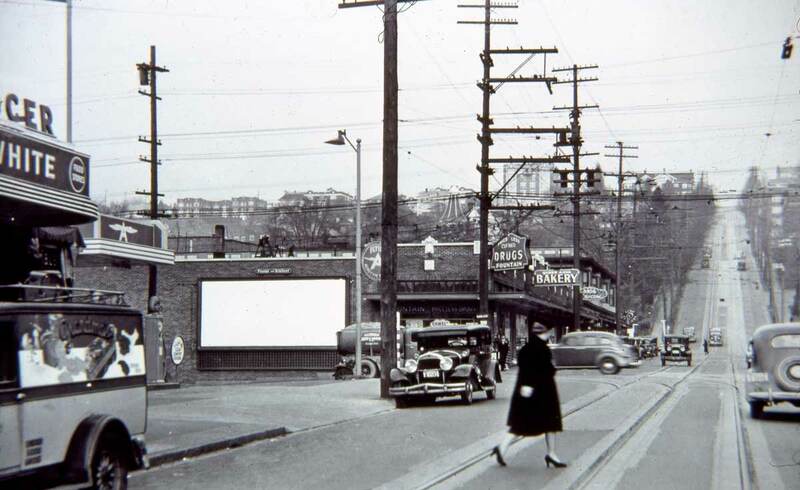 Looking north on Queen Anne Ave to its intersection with Mercer Street with one jay-walker and an example of minimal advertising on the billboard left-of-center. The photo is dated November 15, 1938. At that moment my uncle Thorvald in Ballard might have called my mother Eda Garena Dorpat in Grand Forks, Dakota and heard over the line the cries of the Dorpat's youngest of four sons. Then not yet three weeks old, and recently christened - by my dad Ted - I was probably wanting something that I deserved. 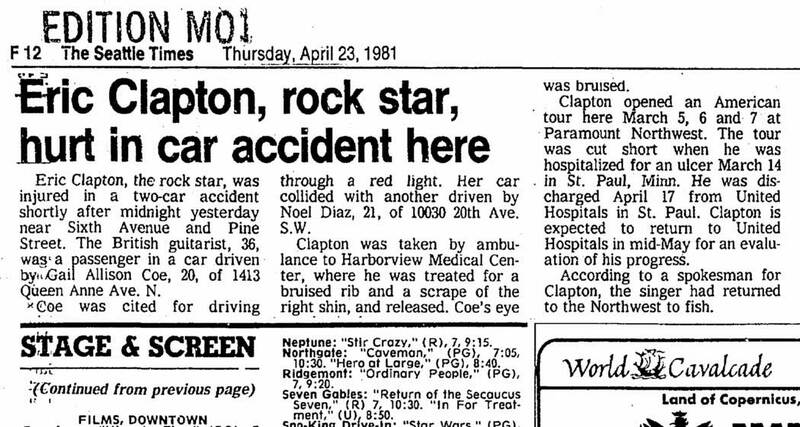 Lawton Gowey's Nov. 10, 1978 "repeat" of the 1938 scene above it. 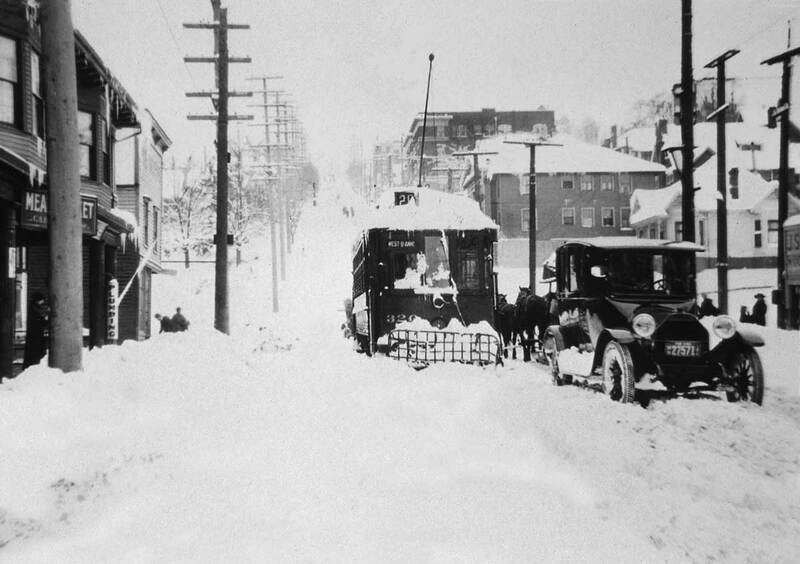 A frozen counterbalance during the city's big snow of 1916. 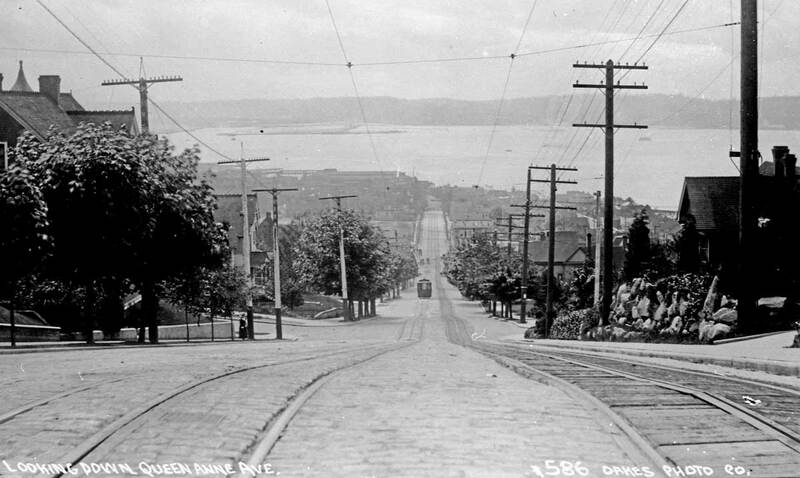 The view looks north on Queen Anne Ave with the recorder's back to Mercer Street. Neary 63 years later another snow on the counterbalance. Although not so big as the 1916 stall, this one in late 1968 was inhibiting. 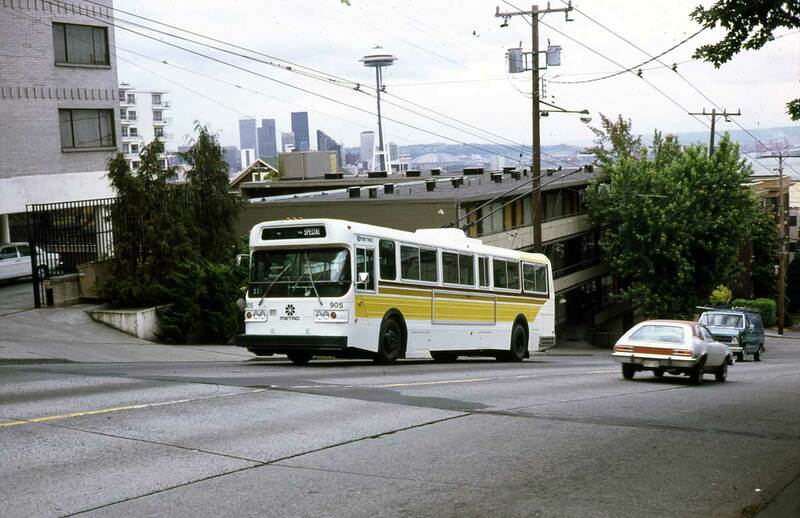 I remember it well shutting down traffic in the University District. 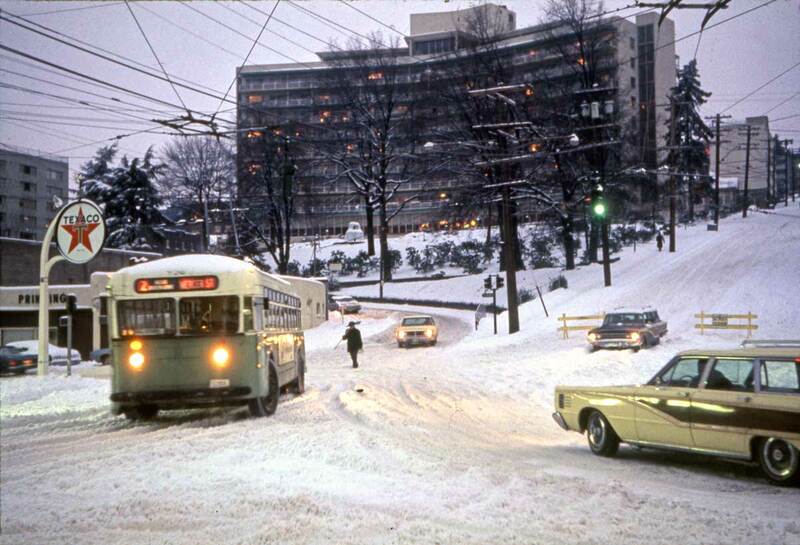 Lawton took this photo on Dec. 31, 1968. 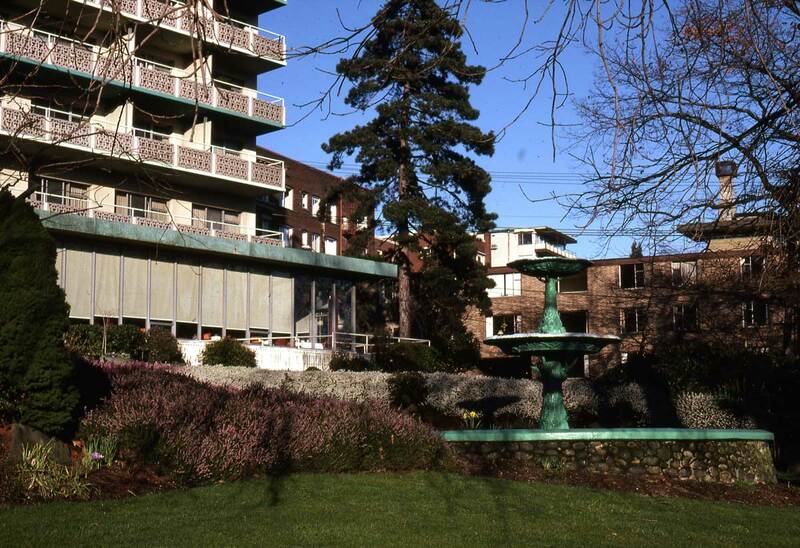 The here decade-old Bayview Manor, which took the place of the Kinnear Mansion, fills the top of the subject. rest of it will be added later in the week as an “addendum,” of some of it, perhaps, simply added later in the morning. Meanwhile here is a detail from that 1902 record above that shows the Kinnear mansion – in anticipation. Looking down on the Kinnear mansion from a higher apartment building to the southwest. 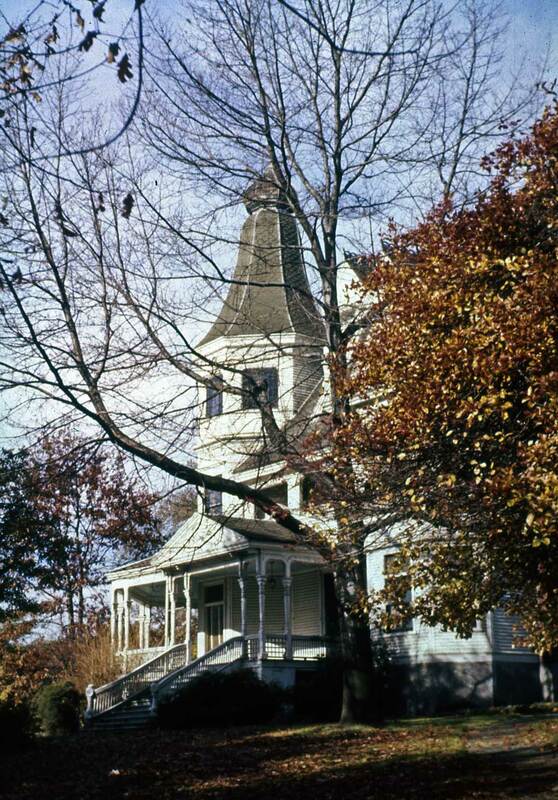 The Kinnear home in the fall of 1957. In 1885 George Kinnear decided to build his home in the sticks, but not of them. 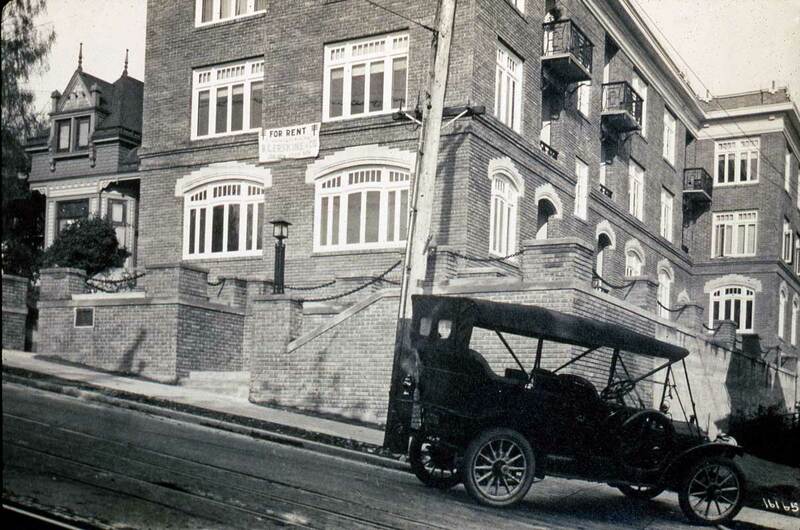 For two years 24 carpenters fashioned and then polished the walnut, cherry and mahogany shipped here from Syracuse, N.Y., into what was, for more than 70 years, lower Queen Anne’s most distinguished landmark. 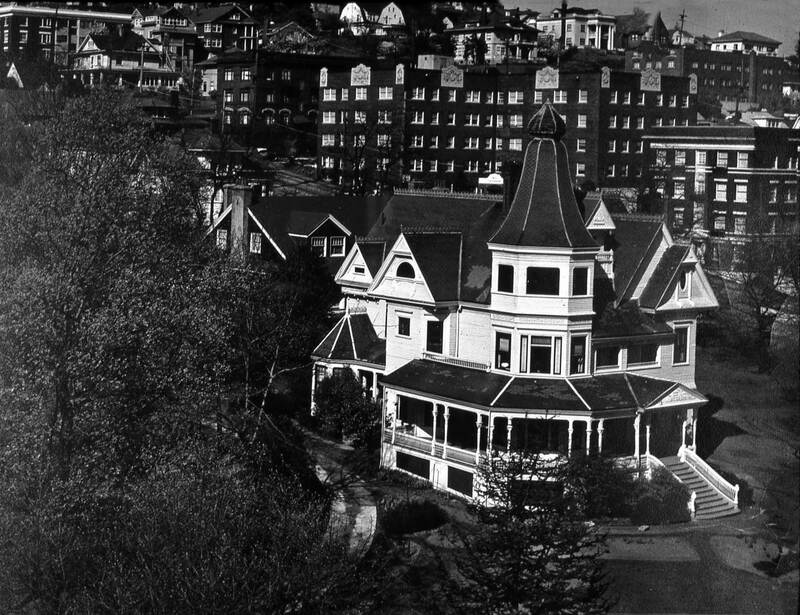 The mansion’s distinction was enhanced by its placement, just far enough up the hill to both be seen and to see over the homes below. The colored view directly above looks northwest across the home’s front lawn. 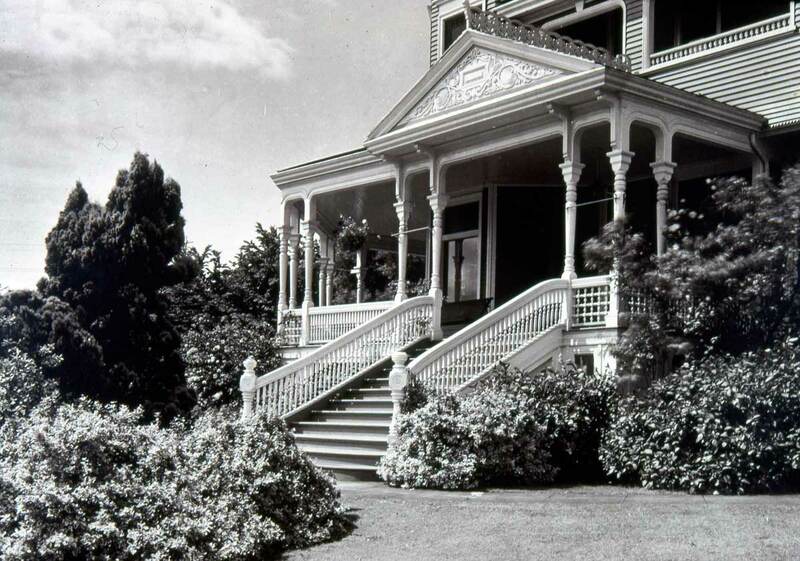 George Kinnear bought this property while on an 1874 visit here from his Ohio home. He purchased it with his earnings as a Civil War soldier. In 1878, he moved here with his wife and three boys and was soon one of the city’s big movers and shakers. He is best remembered today for donating 14 acres adjacent to his home for a city park. Kinnear’s gift to the city was a mix of altruism and self-interest. 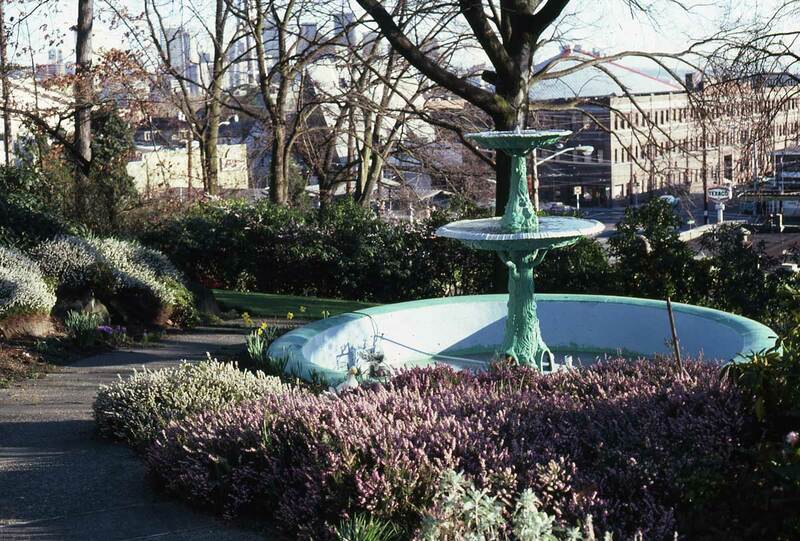 Neighborhood parks were often privately landscaped to attract buyers to the city’s suburban areas reach by trollies, such as Leschi, Madison, Madrona and Ravenna. 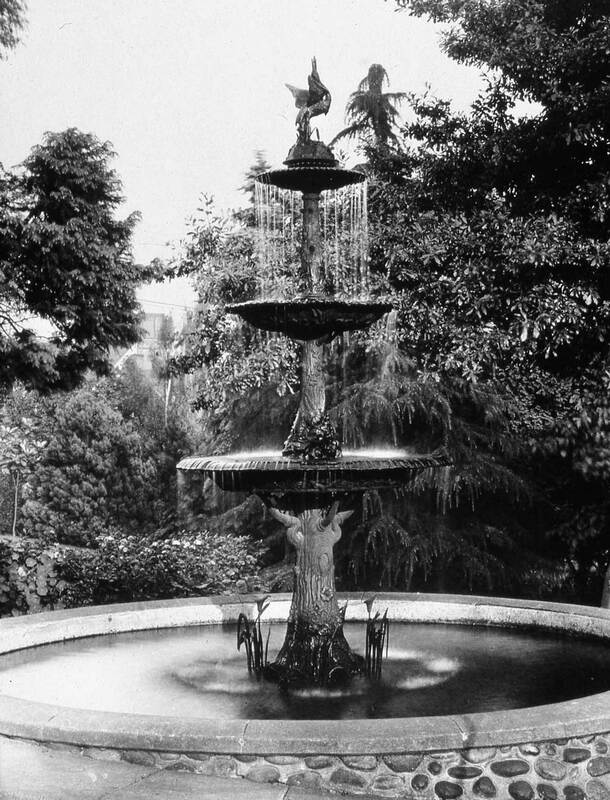 With the razing of the home in 1958 for the building of Bayview Manor, the fountain was kept. 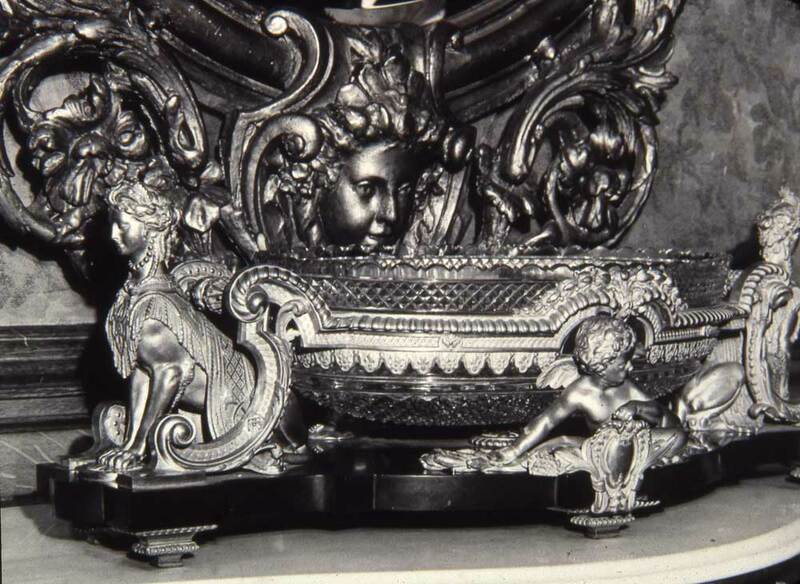 Another Gowey view of the preserved fountain. This one, like that above, was recorded on Feb. 28, 1981. 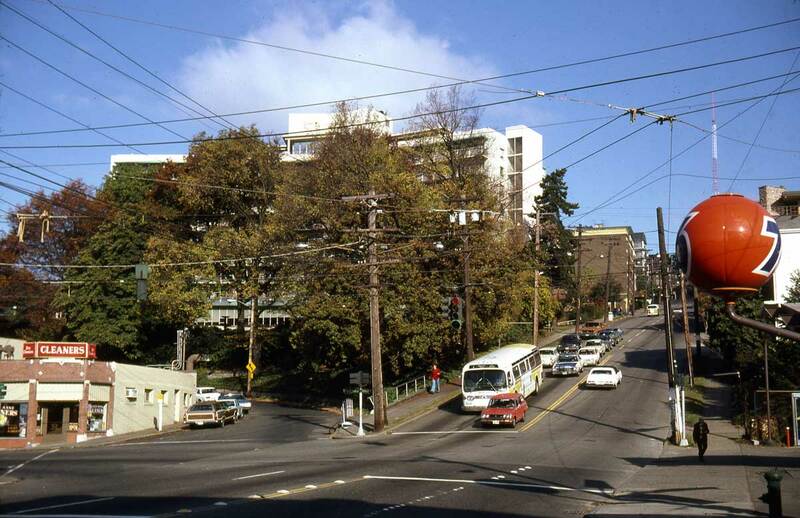 It looks southeast and the McQueen Apartments on the northeast corner of Queen Anne Ave. and Mercer Street can be glimpsed through the limbs, upper-right. The Marqueen Apartments on the right. 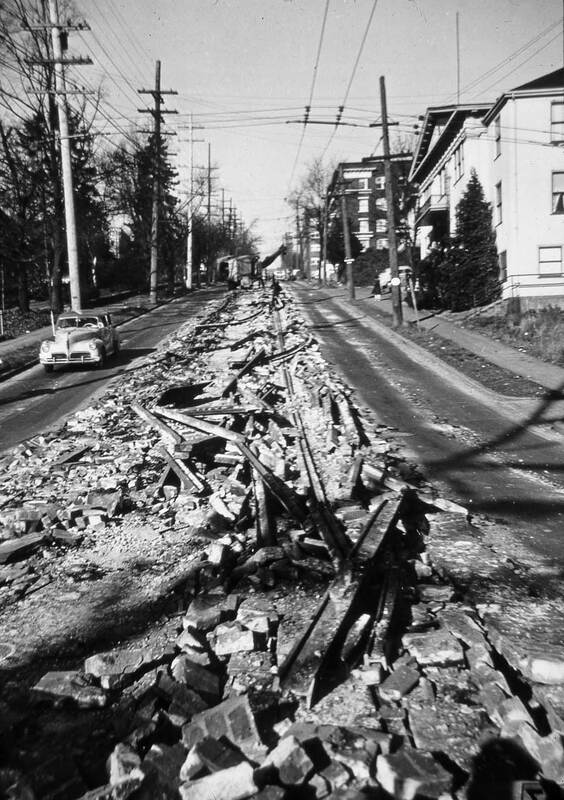 With his back to Mercer Street Lawton Gowey recorded this look north on Queen Anne Avenue on March 21, 1966, years after the Kinnear mansion's destruction. 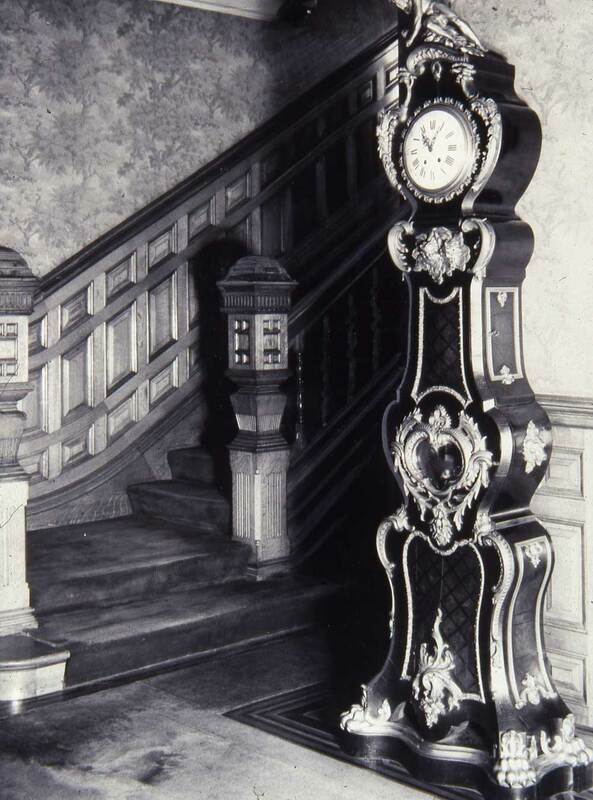 The Kinnear clock at the foot of the stairs was for more than telling time. 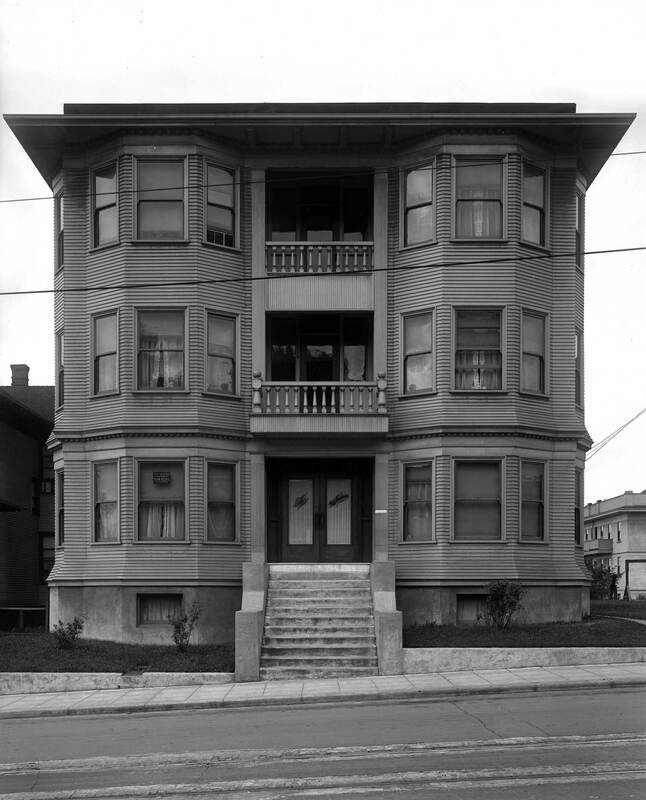 The Amalfi Apartments on the east side of Queen Anne Ave. at Comstock Street. It looks brand new with a for rent sign on the left. I don't know the date - as yet. 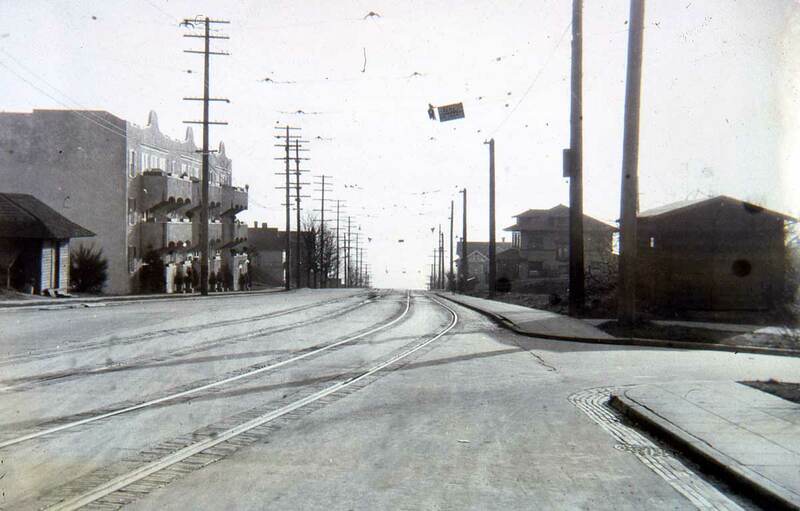 I'd bet that Diana James does..
Queen Anne Ave. looking south through its intersection with Lee, on the far right. The Amalfi Apts are far left just north of Comstock Street where the Counterbalance concluded its tunnel and its service. 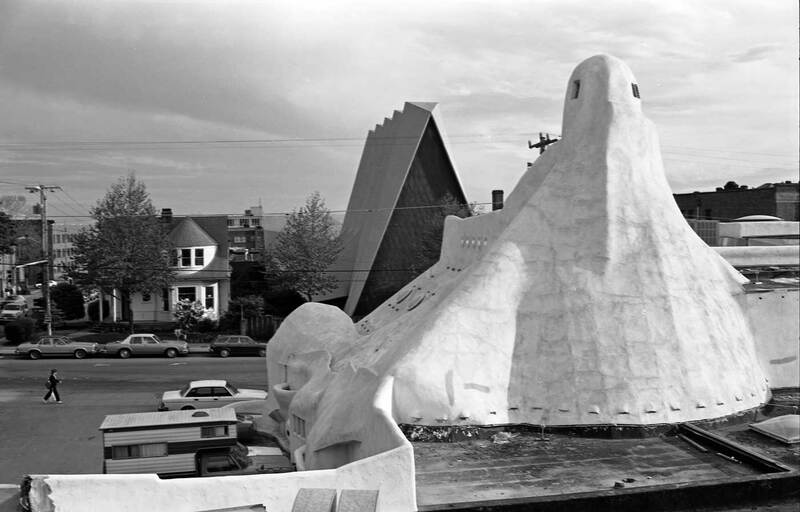 Another of Lawton Gowey's "repeats" on Nov. 10, 1978. 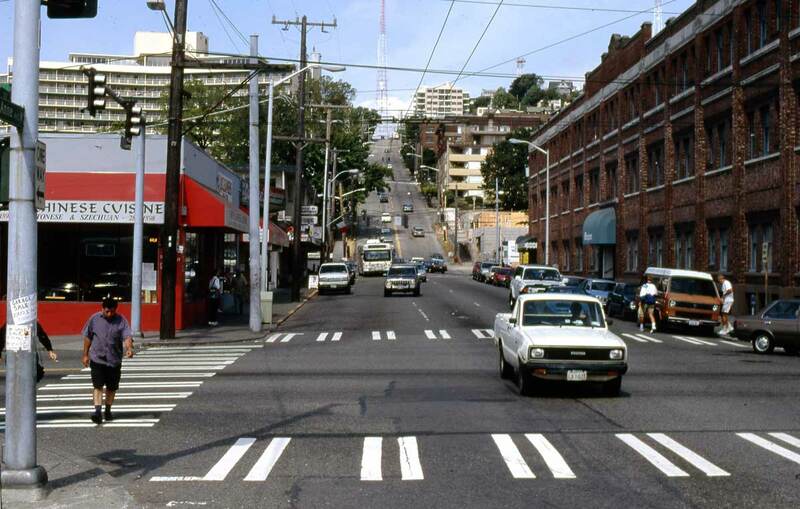 This one looks south, again, thru Lee Street on Queen Anne Avenue, and here too the Amalfi appears left-of-center. The Wilhelmina is a few yards behind Lawton. 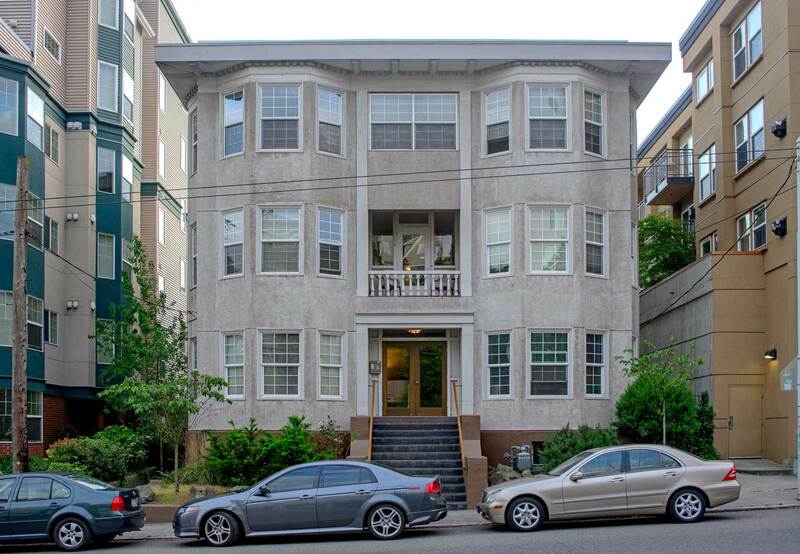 At 916 Queen Anne Ave. and just south of Ward Street, this brick apartment was recently restored and enlarged. It is now called the Leona - and may have been the Lenoa then too. An adventure with the S. Times key word search would solve that. Also a visit to the site via Google Earth recorded its street view when the restoration and additions were a work-in-progress. Lawton Gowey's repeat from Feb. 21, 1981. 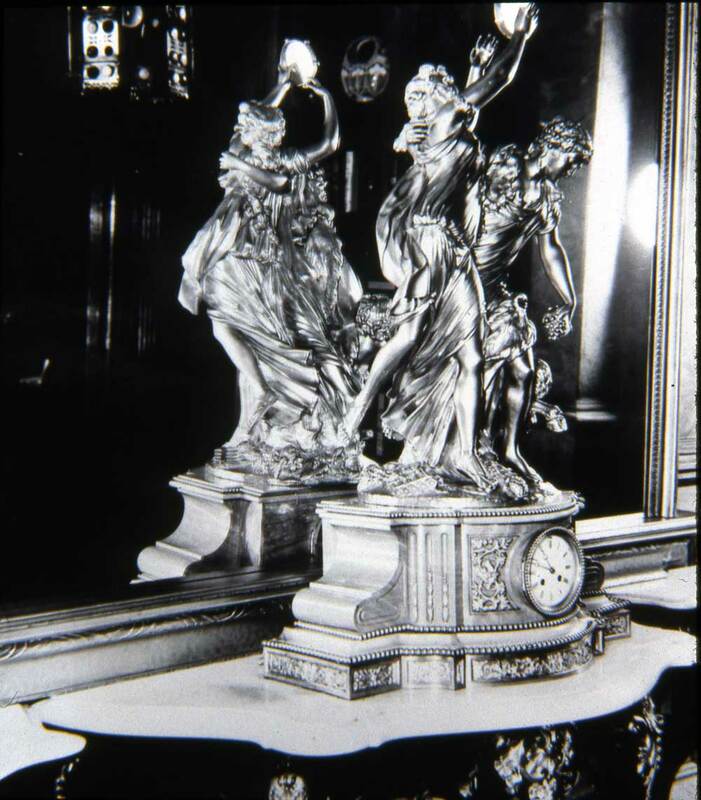 The cornice may have been a victim of the either the 1949 or 1965 earthquakes. 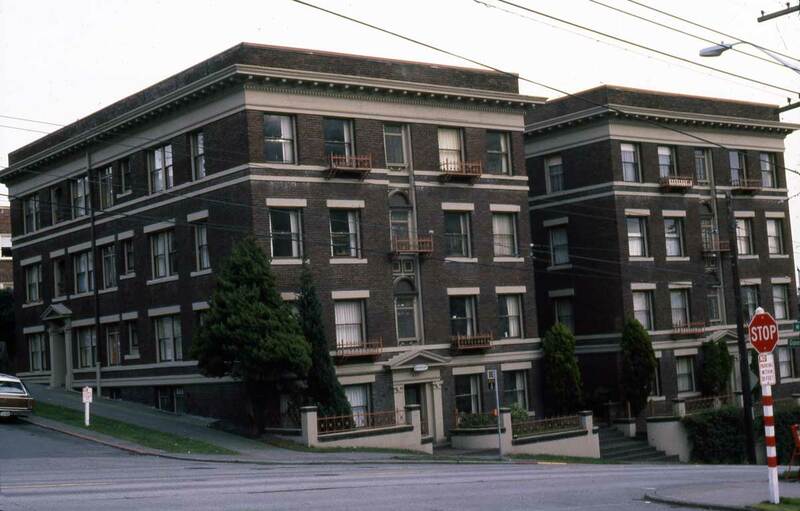 The Castle Court Apartments at the southeast corner of Queen Anne Ave. and Aloha Street. The number is 822 Q.A. Ave. Lawton's copied did not reveal a date. 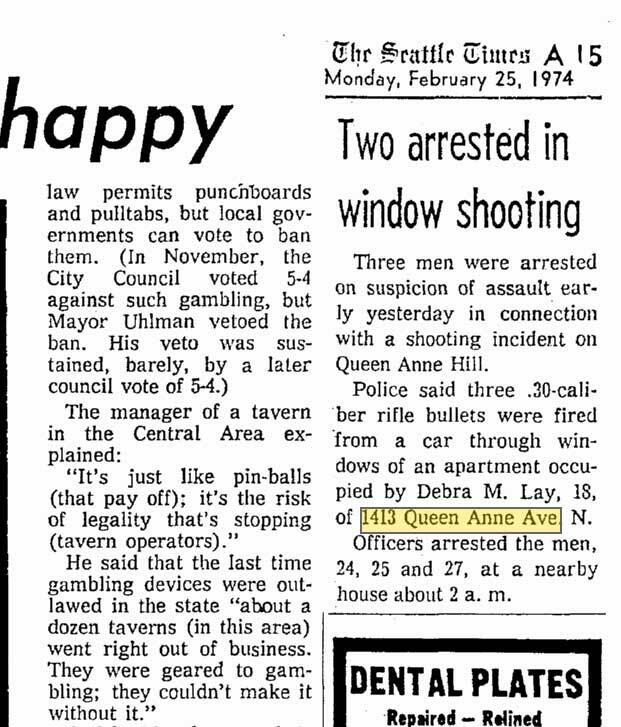 Lawton Gowey's repeat of the Castle Court Apts on Feb. 21, 1981. Lawton was old enough to remember the trolleys that kept to tracks, and with his dad pursued them and trains of all sorts first and then later buses too with cameras as snapping rail fans. After his sudden death Lawton’s family donated his large collection of negatives and prints to the University of Washington Northwest Collection. His smaller collection of Queen Anne slides came to me, and I am now arranging with the Queen Anne Historical Society to have them scanned by them – and me – and donated to them. Here are three examples of Lawton’s pursuit of moments in Counterbalance transportation history that may excite any student-fan of common carriers. For comparison here is real photo postcard artist and hustler Oakes look down the Ccounterbalance from near Comstock ca. 1910. Note the slots running between the rails. 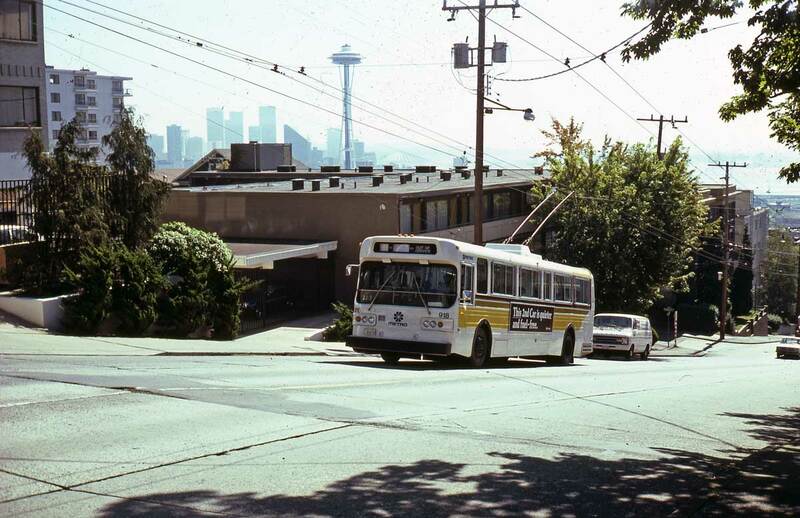 One of the older trackless trollies climbing the Counterbalance near Highland Drive on Oct. 15, 1976. This was handy for Lawton; he lived nearby. This one has "special" on its front-end reader board. 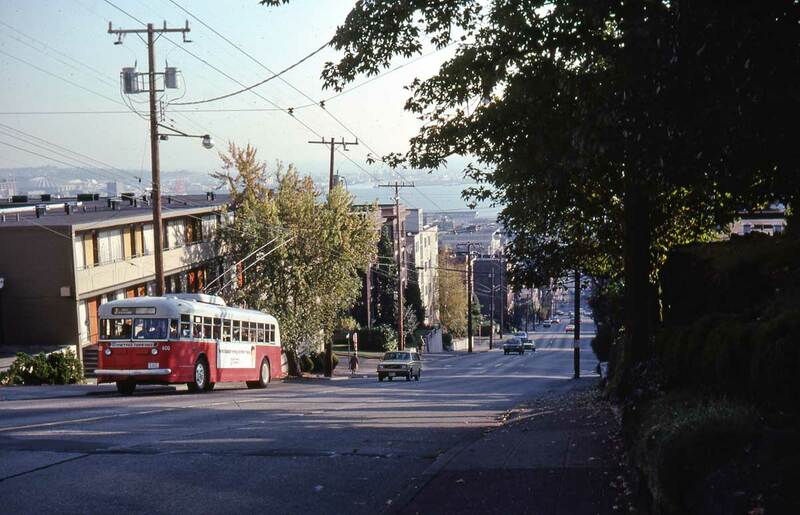 The new trolley is getting a "load test" on Queen Anne Ave., again near Highland, on June 29, 1979. Lawton Gowey was ready and waiting to snap this look at Municipal Transport No. 918 climbing the Counterbalance - near Highland - on its Sept. 14, 1979 inaugural run. Lawton Gowey with camera and notebook faces camera at the center of this waterfront scene, recorded at the foot of Pike Street, appropriately with one of the waterfront trollies approaching at the rear. Lawton's water dept identification card. 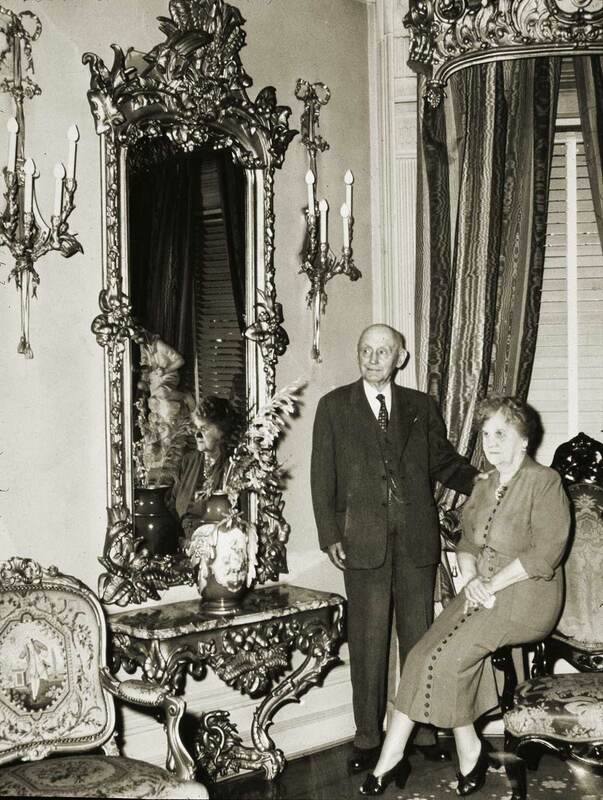 Lawton also loved marine history, English history, and his family. 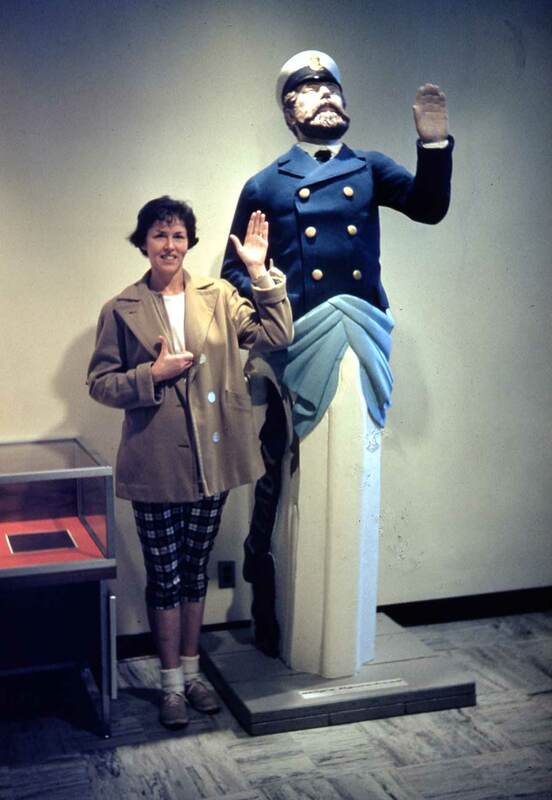 Here his wife Jean repeats the gesture of a figurehead in a Vancouver B.C. museum. Lawton recorded this on June 7, 1962.